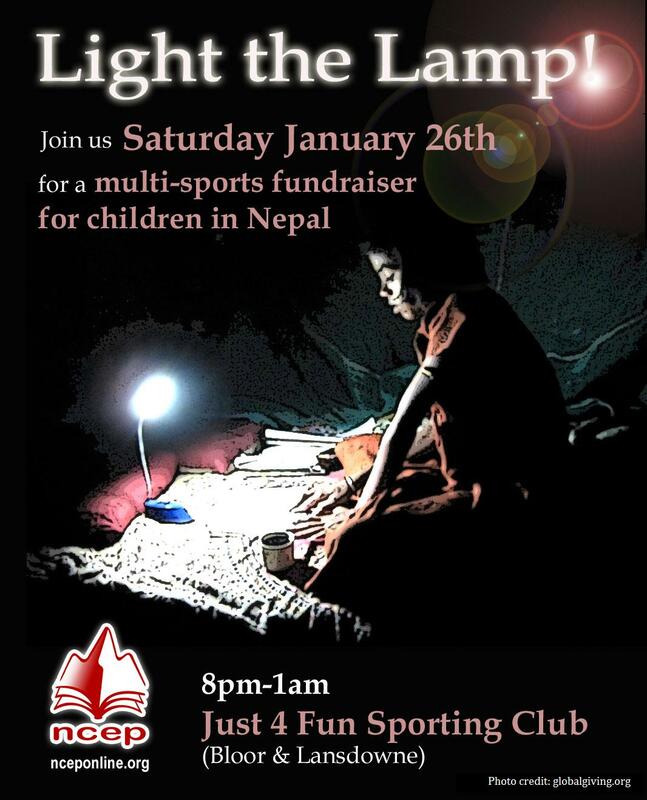 “Light the Lamp: Brighten a Future” will be a lively night of sports and socializing, all for a great cause. Join our facebook event page to learn more! We invite you to join us for a variety of fun sports from floor hockey to soccer to volleyball to dodgeball; there is something for everyone! When you need a break, come socialize and watch the games from the lounge, and enjoy some great music from DJ Paradise Valley, delicious food from Mt. Everest Restaurant, and our fully licensed bar. Whether you are new to athletics, or are a recreational sports enthusiast, this event is designed to be inclusive and fun for all levels. And if you’d rather sit out the sports event and socialize, the Entry Only ticket option should suit you quite nicely. Saturday January 26 2013 | 8 p.m. – 1 a.m.
$25.78 early-bird special, $30 at the door. Tickets include entry, participation in the sports tournament, and finger foods. If you wish to attend but not participate in the sports, we invite you to pay $15.59 in advance or $20 at the door. Please arrive on time! Sports will start promptly at 8:30pm, so give yourself time to change and warm up. Make sure you bring a dark t-shirt and a white t-shirt, plus a refillable water bottle if you are playing sports. You’ll also need running shoes, and shorts/track pants. Bring a change of clothes for when you want to shift from sports to socializing. The sports will be co-ed, fun, and inclusive. No matter your age, gender, or ability, we welcome and encourage you to join. Free parking is available at the venue for up to 30 cars. There is also plenty of nearby street parking. Saftey first! When you arrive, you’ll be asked to sign a brief waiver. Safety of all players/participants will be a priority at the event. Q: Why are the prices not round numbers, like $25 or $15 dollars? A: We want as much money as possible to go to supporting our programs – those extra few cents actually cover the amount PayPal charges us. This way, after the fees, we are left with a nice round number (like $15 or $25) to go to our programs. Q: I just signed up with a few friends. We are really excited! What should we bring/wear on the night? A: This will be a night of sport and fun, so dress accordingly. You’ll want comfortable clothes and shoes that you can run around in. A water bottle and towel might be a good idea too. If you want to bring a change of clothes, there will be change rooms. And of course, don’t forget to bring your wallet, as there will be drinks (yes, we have a fully licensed bar), raffles, items for auction and more! If you are coming for the event only, feel free to dress however you feel comfortable – there will likely be a range of dress, from sporty to business casual. Q: I signed up online but had trouble paying through PayPal. What should I do? Can I just pay on the night of? A: If you have trouble paying, please send an email to donate@nceponline.org with your name and a detailed description of the trouble you are experiencing. You will want to pay in advance to secure your spot. Space is limited, and spots can only be held for those who have paid. If you opt to wait and pay when you show up at the event, you may be restricted to being an observer only. Q: I signed up online and payed through paypal – Do I need a ticket to get in on the night of the event? A: This is a “ticket-less” event. If you have already signed up and paid, all you need to do is bring one piece of government-issued Photo ID that matches the name you registered with. Q: I bought a ticket to “light the lamp” for $25.78. On your website it says any donation over $20 is eligible for a tax receipt. Why do I not get a tax receipt? A: The CRA is very clear about charities distinguishing between pure “donations” and “money paid in exchange for some benefit”, In this case, your contribution of $25.78 cannot be considered a donation because you benefit from receiving 4 hours of sports, free drink tickets, finger foods and more. However, during the event, should you choose to make a donation for over $20, you will qualify for a tax receipt. Q: I noticed there will be a licensed bar. I am under 19 years of age, can I still come? A: Yes! You just will not be able to consume any alcohol, sorry. We will be ID’ing everyone at the door and will simply notify our bar staff of anyone under 19 years of age so that they are not served.